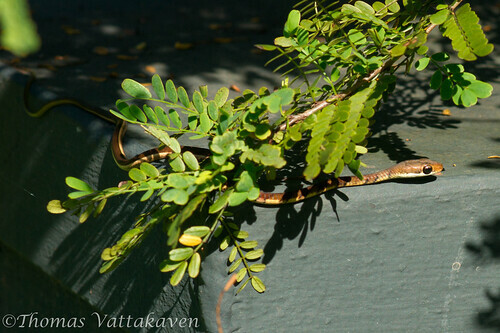 Featured here (the first snake on Nature Magnified) is a Bronzeback Tree-snake (Dendrelaphis tristis). This specimen appears to be a juvenile. The young are only 15 cm at birth but they can grow up to 1.5 m in length. Eggs are laid between February and September. 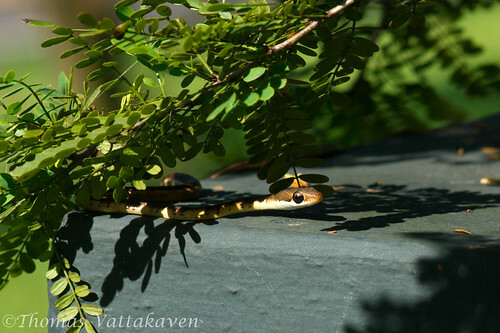 The Bronzeback is a non-poisonous snake and prefers to dwell on trees. They have flat heads and large black eyes. They get their name from the wide bronze stripe that runs down the centre of it’s back. The young ones have a faint banded pattern as seen here, which however disappears by the end of the first year. 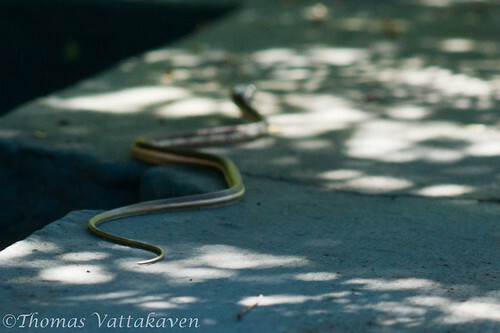 These snakes are active by day and do not mind even the scorching summer temperatures. When engaged, they are known to display a strange wavering dance by moving their neck and head from side to side and can bite with quick jabs. They are known to jump from trees to the ground. They feed on frogs and lizards but have also been known to prey on small birds.